Green Projects Ongoing, How we are trying to reduce our carbon footprint. 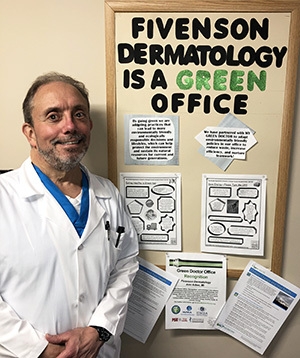 For dermatologists such as David Fivenson, climate change resulting from the trapped heat of sunshine is about as far as you can get from fun in the sun. The physician and researcher in Ann Arbor, Michigan, expects that as the planet’s temperature goes up, incidence of dermatological disease will, too. Some examples: skin cancers from more time exposed to sun and unprotected, insect-borne skin diseases as bug vectors move north with the warming environment, fungal infections and chemical exposures from water polluted by natural disasters, and stress-related exacerbations of conditions such as psoriasis. Dr. Fivenson is working to galvanize his specialty to take stands that prepare the dermatological community to counter the growing crisis. He says many dermatologists realize the time has come. “It was under the surface, and when you open it up, people say, ‘That’s important to me’,” Dr. Fivenson says. An example of the interest: about a year ago, Dr. Fivenson and two colleagues, Drs. Mary Williams of the University of California, San Francisco and Micha Rosenbach of the University of Pennsylvania, were the core of an interest group of members of the American Academy of Dermatology. In only about a year, the group now has about 75 members and official recognition from the AAD as the expert resource group on climate change and environmental affairs, he says. Dr. Fivenson’s action steps mirror those in the position statement. Physicians should raise awareness of the effects of climate change on skin health. They should educate patients about how climate change will affect them. They should reduce carbon footprints of their own facilities (Dr. Fivenson works with another physician group, My Green Doctor, on this). And physicians should work with other medical societies on public education as well as ways to reduce the damage that climate change is causing.